Japan had conquered many colonies and other states during World War II. Special currency notes were officially issued by Japan in these states to replace local currency. 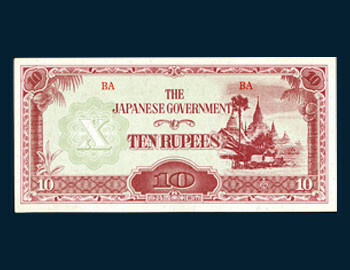 These currency notes were known as Japanese Invasion Money. Both Wartime Finance Bank and the Southern Development Bank used bonds to raise money. Wartime Finance Bank gave loans to military industries, and the Southern Development Bank gave loans for hydroelectric generators, electric power companies, shipbuilding and petroleum. In March 1945, the outstanding balance of Southern Development Bank notes stood at more 13 billion.